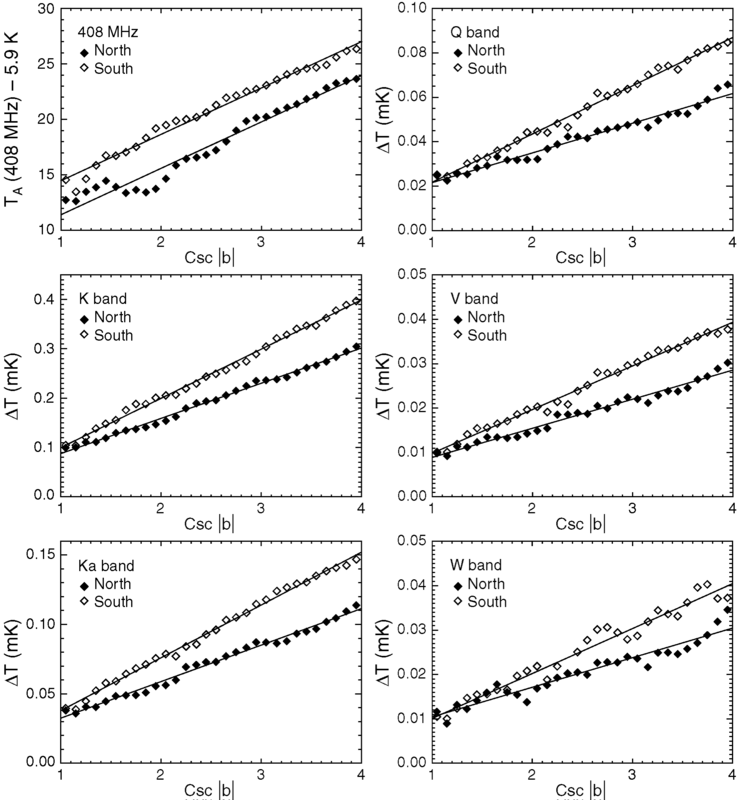 WMAP First-year Paper Figures, Bennett, et al. Solid curve: histogram of pixel values in the K-band map; dotted line: symmetric reversal of the negative sky temperature portion of the solid curve about the peak value; dashed curve: their difference or remainder, which is attributed to excess foreground emission. 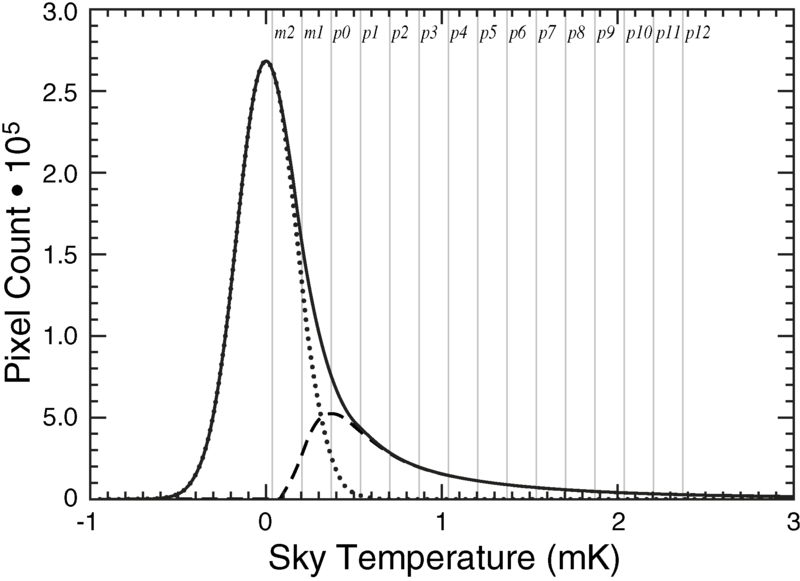 The peak of the remainder curve defines the K-band sky temperature cutoff for the mask that we call ‘‘ Kp0.’’ A series of masks with varying degrees of severity are likewise defined with ‘‘m’’ for ‘‘ minus ’’ and ‘‘ p ’’ for ‘‘ plus,’’ as shown. Temperature steps are defined by the rms half-width of the sky histogram for values less than the mode. (a) Hα map of the sky, corrected for extinction. The correction is only an approximation and is especially unreliable for regions where τ > 1. These high-opacity regions are roughly demarcated by the contour lines, which have been smoothed for clarity. 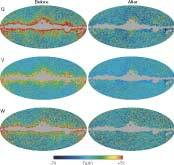 (b) Full-sky map of free-free emission based on the five bands of WMAP measurements. The map is the result of the MEM modeling process, as described in the text. (c) Pixel values in the MEM-derived free-free map compared to their values in the Hα map, with each point representing an average in Hα intensity bins of ΔI = 8 R. The lack of scatter in the fainter bins reflects fidelity to the prior assumption of 11.4 μK R-1 at K band. 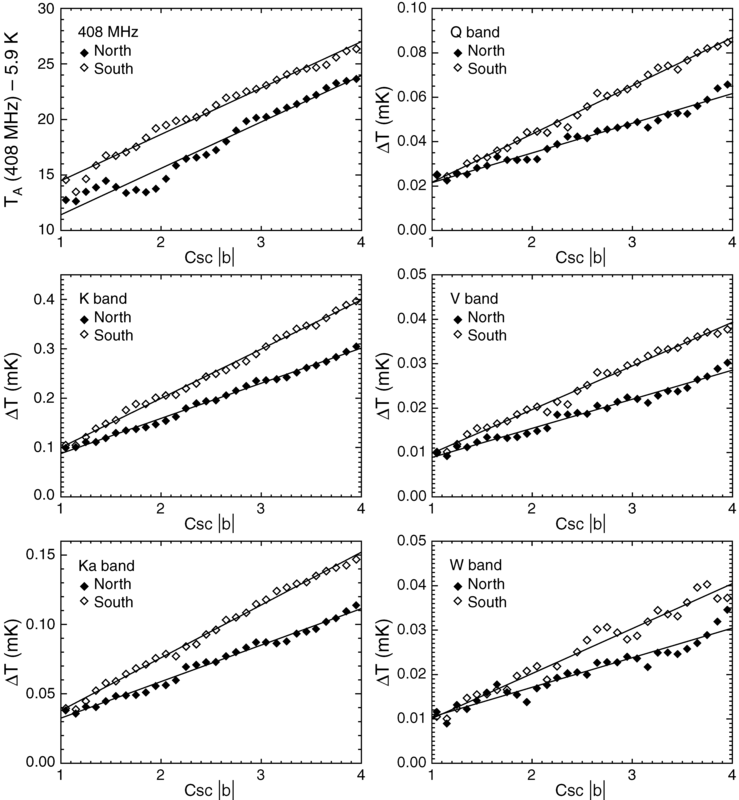 The data plotted only include pixels where the Hα optical depth is estimated to be less than 0.5 and the K-band antenna temperature is greater than 0.2 mK. The data are consistent with the μK R values given in Table 1 within roughly ±12% uncertainty, depending on the fitting method used. (a) Haslam 408 MHz sky map, largely dominated by synchrotron emission. (b) 23 GHz K-band WMAP map, also dominated by synchrotron emission, but more concentrated toward the plane than the 408 MHz Haslam map because flatter spectral index regions increasingly dominate at the higher observing frequencies. The steep spectral index North Galactic Spur, for example, is much less apparent at WMAP frequencies. The variable synchrotron spectral index across the sky renders the Haslam 408 MHz map an inaccurate tracer of synchrotron emission at microwave frequencies. (c) Spectral index map of β(408 MHz, 23 GHz) showing the flatter spectral index (β ~ 2.5) regions of active star formation in the plane, where the cosmic-ray electrons are generated. The steeper spectral index regions (β ~ -3) off the plane suggest the energy losses suffered by the cosmic-ray electrons during the period of time required for their diffusion away from the star formation regions of their origin. This spectral index map is dominated by synchrotron emission but still contains free-free emission. It has been generated after setting zero points based on cosecant fits to both maps, which provides an absolute zero point for the WMAP map. (a) FDS dust map at 94 GHz based on data from IRAS and COBE. This map is used as a prior in the MEM fit. (b) Full-sky thermal dust map from the MEM procedure run on the five-band WMAP data and shown for W band. The morphology is found to be similar to both the expectation (prior) in (a) and the synchrotron result map in (c). 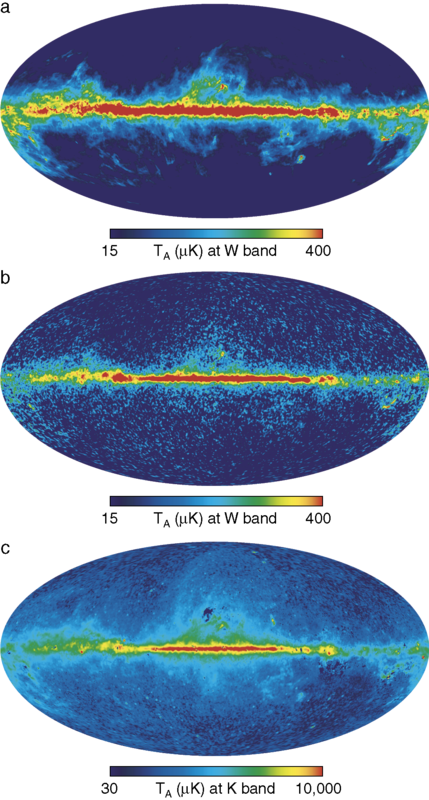 (c) Full-sky map of synchrotron emission referred to K band, based on the five bands of WMAP measurements. The map is the result of the MEM modeling process, as described in the text. Note the rough similarity of the microwave synchrotron emission to the thermal dust emission. This is presumed to be a result of their common origin in regions of star formation. 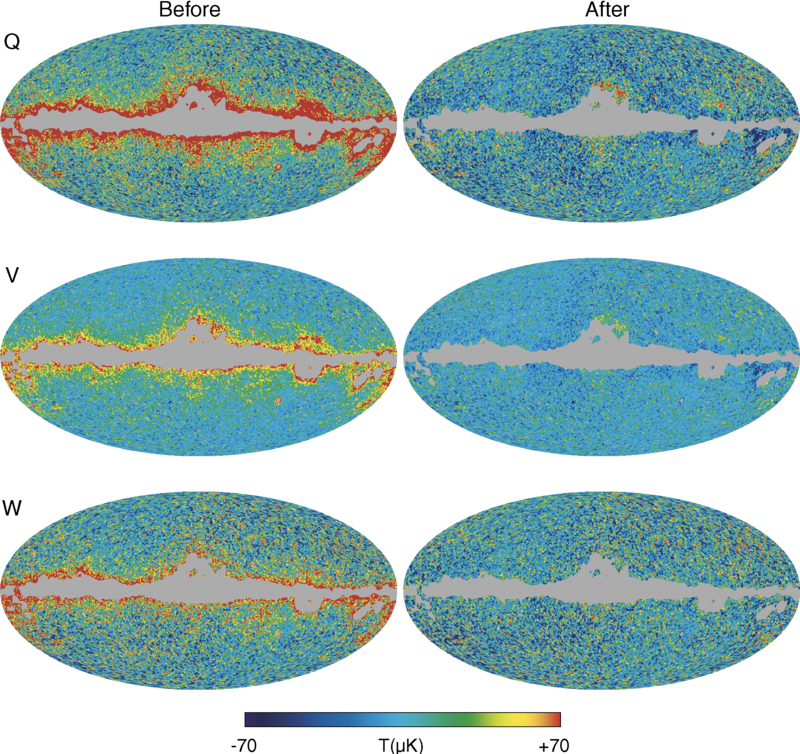 (a) WMAP CMB full-sky map derived from an internal combination of the WMAP data with no use of external data sets, as described in § 4. 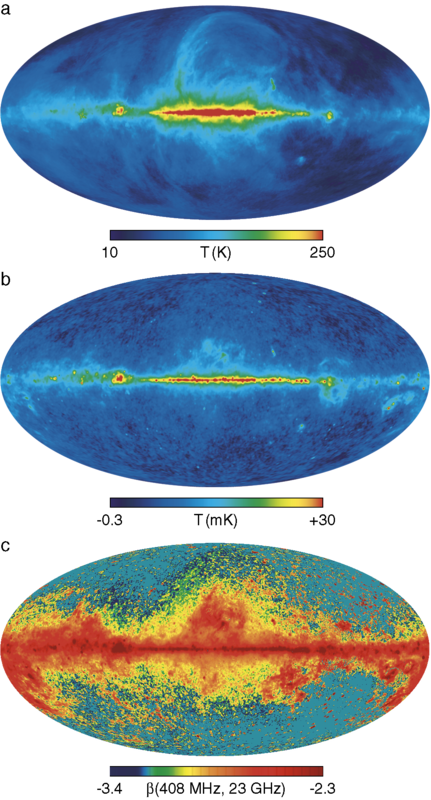 (b) Full-sky CMB map that results from the MEM procedure, as described in § 5. (c) Binned pixel-by-pixel comparison of the MEM-derived CMB map with the CMB map derived by the minimum variance combination technique. Plane-parallel cosecant model giving a fairly good fit to the 408 MHz Haslam map and the five frequency WMAP maps. Application of a cosecant fit is used to set the zero points of the WMAP maps in a self-consistent manner. The southern fit is used to minimize the number of negative map temperatures. Each panel shows linear fits to data averaged over bins in csc b for both northern and southern Galactic latitudes. For the northern latitudes, the longitude range covering the North Polar Spur was excluded. A 5.9 K extragalactic correction (Lawson et al. 1987) was subtracted from the 408 MHz data, and the WMAP data shown here were normalized such that the intercept of the csc b fit for southern latitudes is zero for each band. 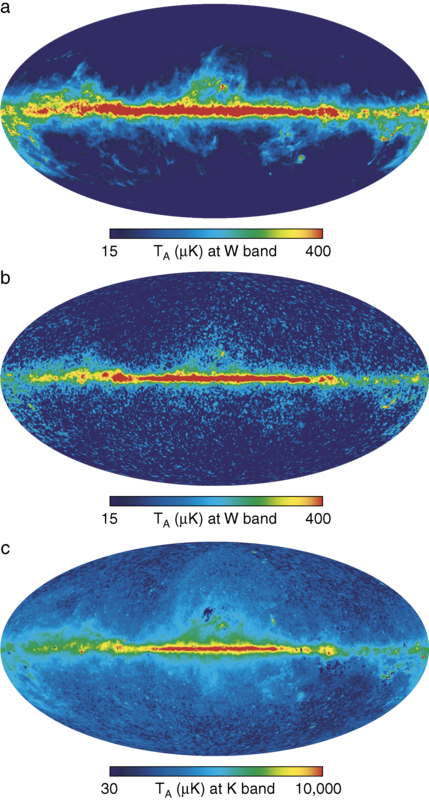 Three color maps of the Galactic emission from the MEM model for K band (top) through W band (bottom). These maps give a feeling for which emission mechanism dominates as a function of frequency and sky position. Synchrotron is red, free-free is green, and the thermal dust is blue. Left: Spectral index histograms of the MEM fit low-frequency component. Lower amplitudes and increased widths of distributions are indicative of lower signal-to-noise ratios rather than physical effects. The histogram only includes pixel values where the total K-band antenna temperature is TA(K band) > 500 μK to minimize low signal-to-noise artifacts. The steep spectral index β ~ - 2.75 between the Haslam 408 MHz measurements and the WMAP MEM solution at K band is seen to steepen further in going from K band to Ka band and even further still to Q band. The total steepening of Δβ ≈ - 0.5 is highly suggestive of synchrotron emission with a synchrotron loss spectral break near K band. There is no evidence for the spectral flattening expected from spinning dust emission. We can thus limit spinning dust emission to less than 5% of the overall Ka-band signal. Right: Spectral index histogram of the MEM fit dust component. The MEM fit to thermal emission from dust gives a spectral index of βd ≈ 2.2 ± 0.1 between V band and W band. The wings of the distribution are dominated by signal-to-noise limitations. CMB vs. foreground anisotropy. 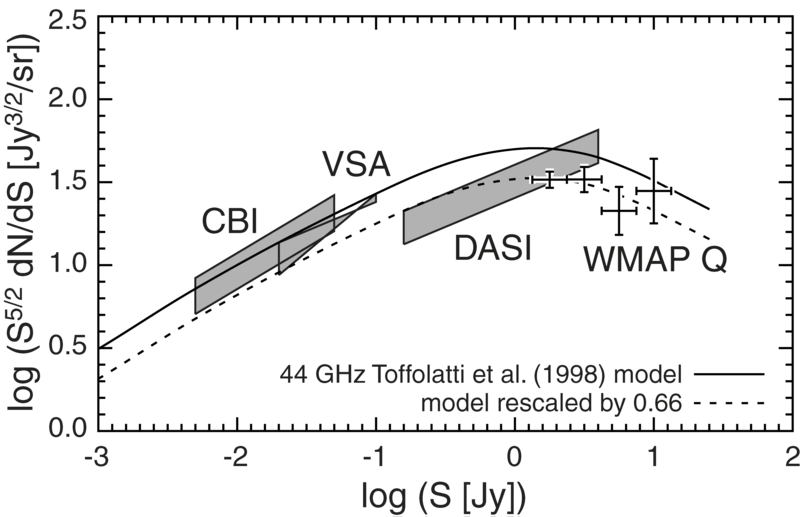 The WMAP frequency bands were chosen to be in a spectral region where the CMB anisotropy is most dominant over the competing Galactic and extragalactic foreground emission. This can now be quantified for WMAP and future experiments. 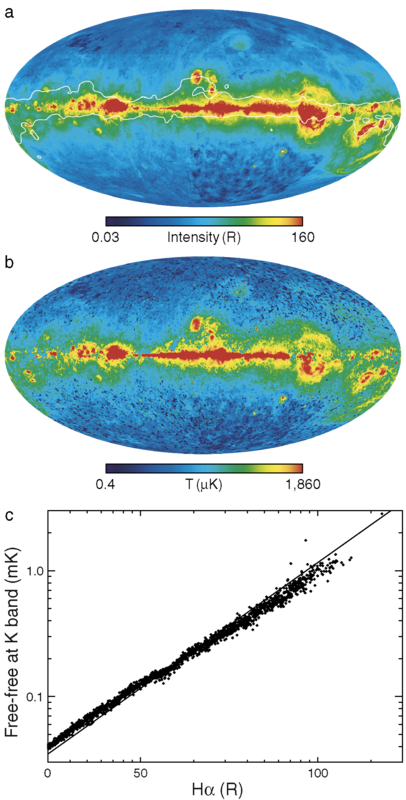 (a) Spectra of the CMB anisotropy and the Galactic emission from the MEM modeling. 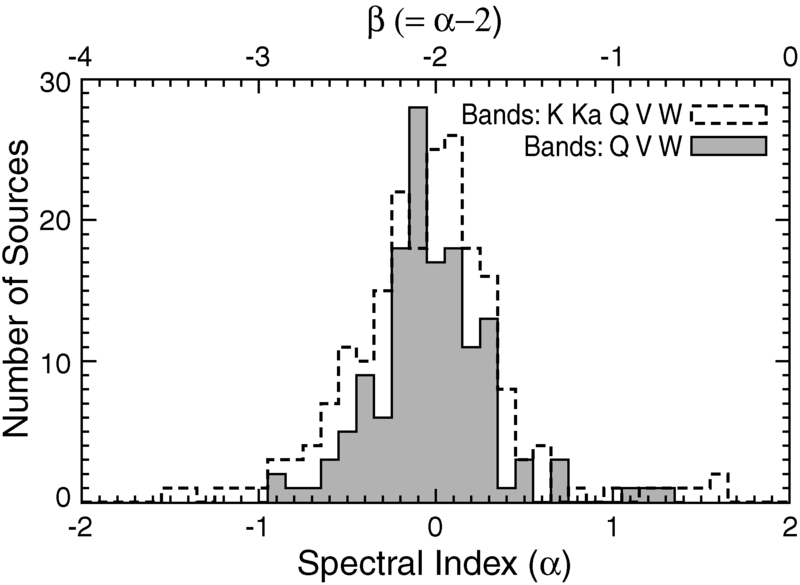 (b) Foreground power spectra for each WMAP band using the Kp2 mask. The power spectra within frequency bands are derived as cross-power spectra between radiometers minus the WMAP-derived CMB model. In K and Ka band, where cross-power spectra are not available, the noise bias has been estimated and subtracted. The band-by-band point-source fits to an l2 term are shown in the dashed lines on the right. The power spectra are expected to asymptotically join these lines. Note that the total foreground power spectra (excluding point sources) go as Cl ~ l-2. (c) Contour plot showing the ratio of CMB to foreground anisotropy power as a function of frequency and multipole moment for the Kp2 mask. Q-, V-, and W-band maps, in CMB thermodynamic temperature, shown with the Kp2 mask applied and a CMB estimate, from Fig. 6a, removed. These maps are individually fitted to template maps of synchrotron, dust, and free-free emission to remove residual foreground contamination. Reduction of foreground emission after template fitting is also shown. The foreground reduction works well, despite the fact that the Haslam map is a poor tracer of synchrotron emission at microwave frequencies, because of the similarity of the thermal dust and synchrotron morphologies. 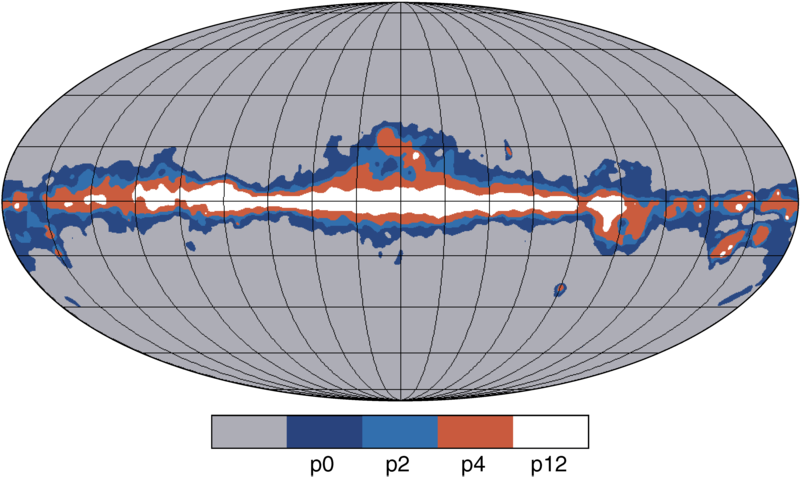 The ‘‘ after ’’ template removal maps shown here represent the residual contamination present in the WMAP CMB cosmological analyses. Higher noise in the ecliptic plane is evident. Spectral index histogram of the 208 point sources detected by WMAP. The mean spectral index is α = 0 (β = -2). Point-source counts derived from the WMAP Q-band source catalog compared with other independent measurements and the T98 44 GHz model. The VSA measurement of dN/dS was made at 34 GHz (Grainge et al. 2003), whereas CBI (Mason et al. 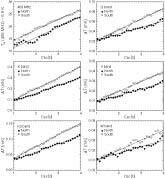 2003) and DASI (Kovac et al. 2002) measurements were made at 31 GHz. The CBI and DASI boxes indicate the 1 σ normalization uncertainty bounds, ignoring the slope uncertainty. For the VSA, we show the region bounded by their quoted upper and lower limits for dN/dS. The rescaling of the Toffolatti model was found by fitting to the WMAP data alone, and not to the other experiments.